The AAA Member Rewards Visa Signature® Card is a cash back credit card backed by the American Automobile Association (AAA), the United States’ foremost advocate for drivers. Issued by Bank of America, it has no annual fee and a fairly generous cash back rewards program that focuses on travel purchases, gas, groceries, and more. Despite its name and branding, the AAA Member Rewards Credit Card is available to everyone. You don’t have to be a current AAA member – even if you are living without a car or drive infrequently, you’re eligible to apply. However, if you are an AAA member, you can count on unlimited 3% cash back on all AAA purchases, including your annual membership dues, guidebooks, insurance products, and passport services. You’ll also earn unlimited 3% cash back on travel purchases such as airfare, car rentals, hotels, rail fares, and travel agency services. All gas, grocery, and drugstore purchases earn unlimited 2% cash back, and all other purchases earn unlimited 1% cash back. If you’re looking for a solid cash back card that returns up to 3% on travel and 2% on a wide variety of everyday purchases, AAA Member Rewards Visa Credit Card is definitely worth your attention. Here’s what you need to know about it. When you spend at least $500 in purchases within the first 3 months, you get a $75 statement credit. The AAA Member Rewards Visa Credit Card earns unlimited 3% cash back on all travel and AAA purchases, including airfare, car rentals, hotels, cruises, rail transportation, AAA membership dues, and various AAA products and services. Subject to change, AAA clubs in Northern California, Nevada, and Utah don’t participate in the 3% bonus category. All gas, grocery, and drugstore purchases earn unlimited 2% cash back. All other purchases, including purchases with nonparticipating AAA clubs, earn unlimited 1% cash back. Each $.01 of cash back is equivalent to 1 point. You can redeem your accumulated cash back points for air travel, hotels, car rentals, hard cash (statement credits), and AAA award vouchers redeemable against AAA purchases. The minimum redemption threshold for air travel is 2,500 points ($25), while the minimum redemption threshold for other redemption options is 5,000 points ($50). Points expire 5 years following the month in which they were earned. There is a 12-month, 0% APR on balance transfers. The promotion begins on the day you open your account. There is no introductory purchase APR. Instead, the purchase APR ranges from 14.49% to 24.49% starting on the day you open your account, depending on your personal creditworthiness. 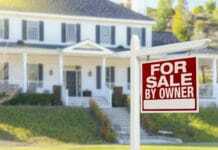 Thereafter, it varies freely with prevailing interest rates. Once the 12-month balance transfer promotion ends, the balance transfer APR falls within the same range. The cash advance APR ranges from 17.49% to 26.49%, also from the day you open your account. The penalty APR is always 29.99%. The AAA Member Rewards Visa Credit Card features optional overdraft protection for Bank of America deposit account customers. 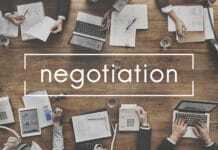 If you choose to participate, transactions that would normally result in negative balances trigger a draw on your cash advance credit line for a sum equal to or greater than the deficient amount. Each overdraft cash advance comes with a fee of $12. On days when multiple cash advances occur, a single $12 fee is charged. Once an overdraft cash advance occurs, it begins to accrue interest immediately, so it’s advisable to pay them off as soon as possible. There is no annual fee. Foreign transactions cost 3% of the transaction amount, while cash advances and balance transfers cost the greater of $10 or 3%. Late payments cost up to $37, while returned payments cost up to $27. No Annual Fee. 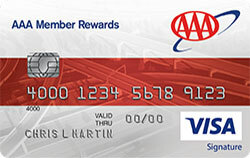 AAA Member Rewards Visa Credit Card does not charge an annual fee. That’s great news for frugal cardholders who wish to maximize their cash back earnings. Some competing credit cards, including American Express Blue Cash Preferred Card, carry annual fees as high as $95. Travel Purchases Earn 3% Cash Back. This card earns unlimited 3% cash back on travel purchases, including airfare, hotels, car rentals, travel agency purchases, and rail fares. No matter how you travel, this is a great deal. In many cases, it’s better than cards that focus more narrowly on travel, such as the Chase Sapphire Preferred Card (which also has a $95 annual fee) and the BankAmericard Travel Rewards Credit Card. Unlimited 2% Cash Back on Gas, Grocery, and Drugstore Purchases. This card earns unlimited 2% back on gas, grocery, and drugstore purchases. These are broad-based “everyday” spending categories that collectively account for a significant share of household spending for millions of American consumers. Easy to Earn the Sign-up Bonus. This card’s sign-up bonus is fairly easy to attain: $75 when you spend $500 within 3 months. If you use this as your primary credit card for that entire period, you should have no problem clearing the threshold. Straightforward Cash Back Redemption Scheme. It’s pretty easy to figure out how to redeem cash back points earned with this card, as there are few surprises or curveballs. Points have a fixed value of $0.01 apiece, and once you hit the minimum threshold, you simply redeem for the award of your choice. No Foreign Transaction Fee. This card does not charge a foreign transaction fee. That’s great news for international travelers, for whom the typical 2% to 3% foreign transaction fees can really drag on vacation planning. 12-Month, 0% APR Balance Transfer Promotion. This card has a 0% APR promotion on balance transfers, good for 12 months from account opening. If you’re carrying high-interest credit card balances from a previous credit card, this is a welcome feature that can potentially save you hundreds of dollars in interest. Not All AAA Clubs Participate in the 3% Cash Back Category. Though most AAA clubs participate in AAA Member Rewards Visa Credit Card’s 3% cash back category, some do not: those include Northern California, Nevada, and Utah. If you live in any of those areas, you won’t earn bonus cash back on AAA member dues or product and service purchases. And, depending on your spending mix, that could be enough to turn you off from this card entirely. Carries a Penalty APR. This card’s penalty APR approaches 30%, kicks in after just a single missed payment, and remains in force indefinitely. If you’ve missed credit card payments in the past or worry that you could in the future, it may behoove you to look for a cash back card with no penalty APR, such as the Discover it Card. Need at Least 5,000 Points to Redeem for Most Items. This card has a relatively high minimum redemption threshold for non-airfare items: 5,000 points, or $50. Light spenders, who can take many months to accumulate the requisite number of points, are better served by cash back cards with no redemption minimums – for example, Discover it or Chase Freedom Unlimited. Mediocre Sign-up Bonus. AAA Member Rewards Visa Credit Card’s sign-up bonus, which is worth $75 on $500 in spending over 3 months, is not particularly impressive. If you’re looking for a more generous entry bonus on a similar amount of spending, check out Chase Freedom or Chase Freedom Unlimited, both of which feature sign-up bonuses of up to $175. With 3% cash back on travel purchases and lower minimum redemption thresholds on airfare redemptions, the AAA Member Rewards Visa Signature® Card merges the best attributes of cash back credit cards and travel rewards credit cards without charging an annual fee or imposing overly confusing conditions or restrictions on its loyalty program. Whether you’re looking for an everyday spending aid that can get you to your favorite travel destinations faster, or you’re simply seeking a reliable return on your credit card spending, do yourself a favor and take a closer look at what this card has to offer. The AAA Member Rewards Visa Card is ideal for people who spend heavily in its 2% and 3% categories: gas, groceries, drugstores, travel, and AAA. With no annual fee or foreign transaction fees, it’s also great for lighter spenders and those who regularly drive or fly outside the United States. However, the 5,000-point redemption threshold is problematic for very frugal cardholders, and patchy club participation can shortchange AAA members in un-served areas. The AAA Member Rewards Visa Signature® Card‘s biggest benefits include its nonexistent annual fee, its lack of foreign transaction fees, its 3% cash back earnings on travel and AAA purchases, its 2% cash back earnings in 3 broad spending categories, its straightforward redemption framework, and its 12-month 0% introductory APR promotion on balance transfers. Its biggest drawbacks include patchy AAA club participation, a penalty APR, the 5,000-point minimum redemption threshold for cash back, and the mediocre sign-up bonus. All told, these drawbacks are relatively minor, so this is an excellent cash back card for AAA members and non-members alike.